It's The Incredible Captain Iron Vision, God of Thunder! 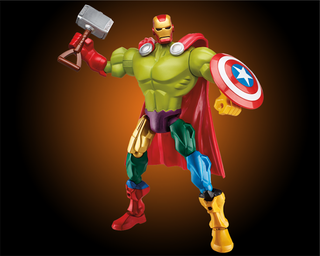 Age of Ultron's absurdly early merchandising machine continues, this time giving us this Frankenvenger mish-mash. Gaze upon it, and tremble! They look pretty nifty, but, this would kind of be more amusing if it had Hawkeye or Black Widow's head slapped on instead of Iron Man's helmet. Well, I say amusing, more like incredibly freaky to see a human's head on top of that thing, but there we go. Expect to be drowned in a sea of Avengers merchandise, including these guys, ahead of the movie's May release.